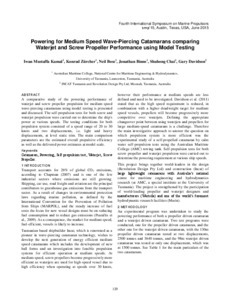 A comparative study of the powering performance of waterjet and screw propeller propulsion for medium speed wave-piercing catamarans using model testing is presented and discussed. The self-propulsion tests for both screw and waterjet propulsion were carried out to determine the ship's power at various speeds. The testing conditions for both propulsion system consisted of a speed range of 20 to 30 knots and two displacements, i.e. light and heavy displacements, at level static trim. The main comparison parameters are the estimated overall propulsive efficiency as well as the delivered power estimates at model scale.